The Gift Voucher revolutionised gift giving, giving the gift of choice with every present and ensuring that your giftee was never stuck with something they didn’t like. Now, Prezzee has improved on the perfect gift by introducing the tradable, digital Gift Voucher, sent directly to your recipient via SMS or email and impossible to lose. 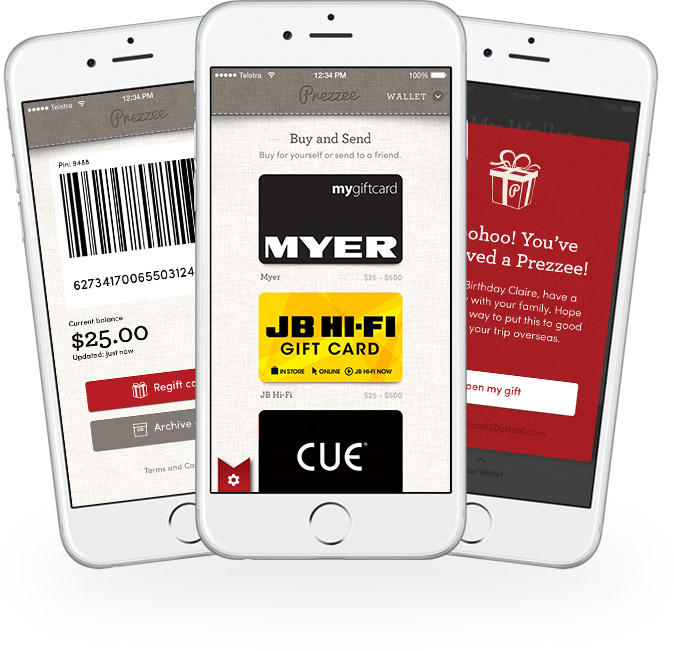 Choose your next eGift Card from Australia’s best stores nationwide with Prezzee. We’ve made buying and sending your Gift Cards easy with a simple online purchase redeemable at over 50 retailers. You also have the option to buy and send Gift Vouchers through the Prezzee App available on any smartphone Gift Cards can also be stored for convenience and safe keeping. You’ll never leave the home without one again. The easy way to give and receive your Gift Cards. We even have a solution for corporate gifting with Prezzee Business if you are doing bulk or regular send outs. Prezzee’s innovative gifting solution gives you flexibility and choice. No matter what or who you’re buying for, a Gift Card from Prezzee is perfect for birthdays, thank yous, anniversaries, Christmas, weddings, and much more. As a recipient, you receive your Gift Card instantly to your mobile phone where it’s ready to redeem whenever you’re ready to shop. Received an eGift Card for a store you don’t normally shop in? Easy fix! Through Prezzee you can re-gift your voucher online, sending it straight to someone else who can store it on their phone and use it straight away.